Omara “Bombino” Moctar, whose given name is Goumour Almoctar, was born on January 1, 1980, in Tidene, Niger, an encampment of nomadic Tuaregs located about 80 kilometers to the northeast of Agadez. He is a member of the Ifoghas tribe, which belongs to the Kel Adagh Tuareg federation. His father is a car mechanic and his mother takes care of the home, as is the Tuareg tradition. Bombino was raised as a Muslim and taught to consider honor, dignity and generosity as principal tenets of life. The Tuareg, known amongst themselves as the Kel Tamasheq, have long been recognized as warriors, traders and travelers of the Sahara Desert - as a people of grace and nobility as well as fighters of fierce reputation. They are a nomadic people descended from the Berbers of North Africa and for centuries have fought against colonialism and the imposition of strict Islamic rule. Bombino spent his early childhood between the encampment and the town of Agadez, the largest city in northern Niger (population about 90,000) and long a key part of the ancient Sahara trade routes connecting North Africa and the Mediterranean with West Africa. One of seventeen brothers and sisters (including half brothers and half sisters from both his mother and father), Bombino was enrolled in school in Agadez, but he demonstrated his rebellious spirit early on and refused to go. Bombino’s grandmother took him in to keep his father from forcing him to go to school, and, like most Tuareg children, he grew up living with his grandmother. Eventually, Bombino gave in and began attending a French-Arabic school that taught both French and classic Arabic. After three years, he left the school and at the age of nine he returned to his grandmother to live the life of an independent Tuareg child. The Tuareg culture is matriarchic, and the elder women are considered the chiefs of the community, the wise sages that represent the power of life, generosity and knowledge. Bombino’s grandmother instilled in him the Tuareg moral code in order for him to grow up as a respected member of society. Young Tuareg boys are called “arawan n tchimgharen,” or “grandmother’s children,” a term that is considered a badge of honor. In 1990, the first Tuareg rebellion began in Mali and Niger when Tuareg commandos launched an attack against local military and government offices. The governments fought back, declaring Tuaregs enemies of the state and forcing many Tuareg’s into exile. Bombino fled with his father and grandmother to stay near relatives in Algeria. One day some relatives arrived from the front lines of the rebellion, carrying with them two guitars that they left behind for a few months. Bombino began to teach himself to play the guitars, plucking out notes in imitation of the ishoumar songs he had heard. In 1992 and 1993, the military regime in Niger was replaced with a democratically elected government, and numerous political parties were formed, largely along ethnic lines. A Tuareg party was formed, and music once again played an important role in educating the community, this time about the importance of a democratic system in Niger. While the armed conflict had not formally ended, Bombino and his family decided to move back to Agadez. On April 24, 1995, the Niger government signed a peace treaty with the rebels and Tuaregs were able to move back to Niger. Around the same time, Bombino got a role as an extra in the French film Imuhar: A Legend, which was filmed in the nearby desert. After finishing his work on the film, Bombino settled into life as working musician, performing at political rallies, weddings, and other ceremonies. He fought often with his father, who did not want his son to become a musician. To escape this problem, Bombino decided to travel to Algeria and Libya in 1996. In Libya, he made friends with some local musicians, and they would spend time watching videos of Jimi Hendrix, Mark Knopfler of Dire Straits and others in an effort to master their licks. Bombino was quickly becoming an accomplished guitarist and was in high demand as a backing musician. While working as a herder in the desert near Tripoli, Libya, Bombino spent many hours alone watching the animals and practicing his guitar. Eventually, Bombino decided to return to Niger, where he continued to play with a number of local bands. As his legend grew, a Spanish documentary film crew helped Bombino record his first album, which become a local hit on Agadez radio. The success of the album validated Bombino’s choice to make a career out of music, and he began playing regularly for tourists and locals alike. In 2006, Bombino traveled to California with the band Tidawt for a tour organized by a non-profit organization. During the trip, he had the chance to record a desert blues version of the Rolling Stones classic “Hey Negrita” alongside Stones’ members Keith Richards and Charlie Watts. The track appears on the 2008 album spearheaded by Rolling Stones saxophonist Tim Riese titled Stone’s World: The Rolling Stones Project Volume 2. Later that year, Bombino served as Angelina Jolie’s guide to the Niger desert region during a weeklong visit. During their time together, he played her the music of the Tuareg and told her stories of nomadic life in the Sahara. In 2007, the second Tuareg rebellion began, and the government countermeasures were forceful and indiscriminate. Many civilians were killed and farms and livestock were destroyed in an effort to quash the rebellion. Instead, the government’s hard-handed tactics only served to galvanize the Tuareg community, and many around Bombino joined the rebellion. Government forces killed two of Bombino’s musicians, so he fled in exile to Burkina Faso along with many of his fellow Tuaregs. In 2009, he met filmmaker Ron Wyman who had heard a cassette of Bombino’s music while traveling near Agadez. Wyman was enchanted by Bombino’s music and spent a year seeking him out, eventually tracking him down to Ouagadougou, Burkina Faso, where Bombino was living in exile. While there, Wyman decided to feature Bombino in a documentary he was filming about the Tuareg. Later that year, he brought Bombino to Cambridge, Massachusetts to begin recording the album Agadez in his home studio. Finally, the Tuaregs put down their arms and were allowed to return to Niger. In January 2010, Wyman came to Agadez to finish the album and the film. The sultan of Agadez allowed them to organize a concert for peace at the base of the Grand Mosque, the first time such a performance had been permitted. Over a thousand people came to celebrate the end of the conflict and danced to the irresistible grooves of Bombino and his band. Bombino’s first internationally released album, Agadez, was produced by Ron Wyman and released in April 2011 on Cumbancha Records. He enjoyed great worldwide acclaim for the album and toured all over the world throughout 2011 and 2012 to further his music and his cause. On April 2, 2013, Bombino made his Nonesuch Records debut with the release of the album Nomad, which was recorded with 2013 Grammy Award-winning Producer of the Year Dan Auerbach of The Black Keys at his Nashville studio, Easy Eye Sound. Nomad debuted at #1 on the Billboard World Music album chart and iTunes World chart and earned rave reviews from top media outlets around the world including BBC World Service, which calls it “utterly, utterly fantastic” and Rolling Stone, which calls Nomad “a perfect match of sound and soul [that] introduces a new guitar hero.” His dazzling live performance and virtuosity on the guitar have led notable music critics to compare him to Jimi Hendrix, Carlos Santana, Neil Young, and Jerry Garcia. After a ‘brief’ 25 hour delay in Morocco on his way from Niger, Bombino arrived in Woodstock, New York in late 2015 to record his next album, Azel (2015, Partisan Records). There were a few remarkable innovations on this album. The first is the introduction of a new style Bombino is pioneering that he affectionately calls 'Tuareggae' - a sunny blend of Tuareg blues/rock with reggae one-drop and bounce. Another is the first-ever use of Western vocal harmonies in recorded Tuareg music (due to Longstreth's influence), which give the songs new depth and color. Finally, the band behind him is tighter and more energetic than ever before. 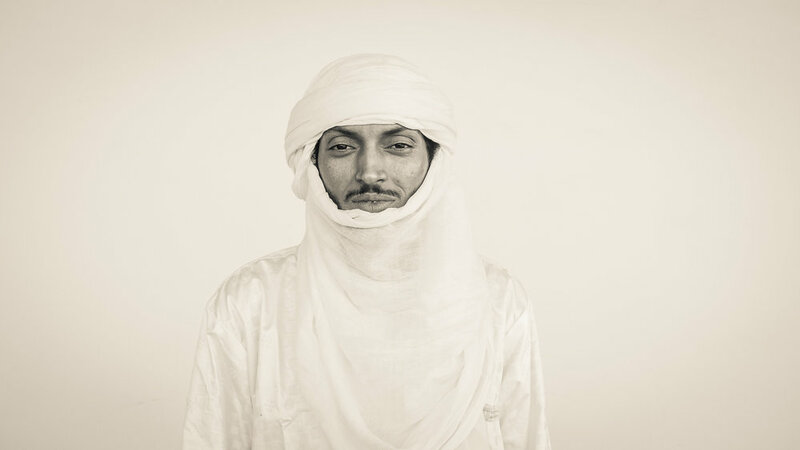 In November 2017, Bombino and his group traveled to Casablanca, Morocco to record his latest album, Deran (2018, Partisan Records). Bombino wished to return to Africa to record and to step out of the shadow of celebrity producers to create the most authentic expression of his music possible. Deran was produced by Bombino's long-time manager, Eric Herman (Modiba Productions) and benefited from deeper involvement from his band - Youba Dia (bass), Illias Mohamed (rhythm guitar) and Corey Wilhelm (drums), and Mohamed Araki Eltayeb (keys) - in arrangement and other creative decisions. The result was Bombino's most mature and well-rounded studio effort to date. Deran was released on May 18, quickly hit #1 on the iTunes World Charts, and was hailed by critics around the world as an instant classic. In the wake of its release Bombino was featured in the New York Times which dubbed him 'the Sultan of Shred' while Noisey dubbed him 'The World's Greatest Guitarist'. Four thousand years of living in a hostile environment taught the Tuareg that the will to survive with dignity intact is stronger than any external threat. Bombino puts that sentiment to music, writes its anthem, and gives it a life of its own. He is known as being emblematic of the next generation of Tuareg, a new voice of the Sahara and Sahel, fusing traditional Berber rhythms with the energy of rock and roll and songs about peace. After thirty years of drought, rebellion, and tyranny, Bombino extols his audience to remember who they are, but also realize who they can be. This biography is based largely on an interview conducted with Bombino in December 2010 and on materials prepared by Ron Wyman of Zero Gravity Films.